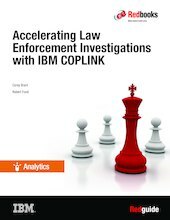 IBM® COPLINK® (“COPLINK”) software is designed to help law enforcement organizations solve crimes faster, keep officers safer, and disrupt crime and terrorism. COPLINK helps to consolidate data from many sources, aid collaboration, and generate tactical leads. It enables law enforcement professionals to generate photo lineups, save their search history, and organize investigations to generate reports more easily. COPLINK also provides comprehensive auditing of data access. Discover investigative case leads by organizing and providing tactical and command-level access to vast quantities of seemingly unrelated data. Perform crime pattern analysis by visualizing and analyzing data on maps through time-sequence playback. Save time with access to disparate heterogeneous law enforcement data correlated in one system. Ensure data protection and auditability with security-rich features, including password protection and data encryption. Put information where officers need it with data search capabilities at the desk, in the car, or on foot with a mobile device. Improve community and officer safety by providing intelligence and situational awareness of persons, locations, and vehicles. A modular design allows COPLINK to integrate with many parts of an organization’s preexisting information structure. Additionally, COPLINK can be deployed in phases according to an agency’s most pressing needs. COPLINK was originally designed with continuous feedback from line-level police officers and detectives and it is continually evaluated for new functionality. This IBM Redguide™ publication describes the IBM COPLINK business value and its solution capabilities. This guide is intended as an introduction for law enforcement executives, and for those evaluating advanced law enforcement software solutions for their organizations.